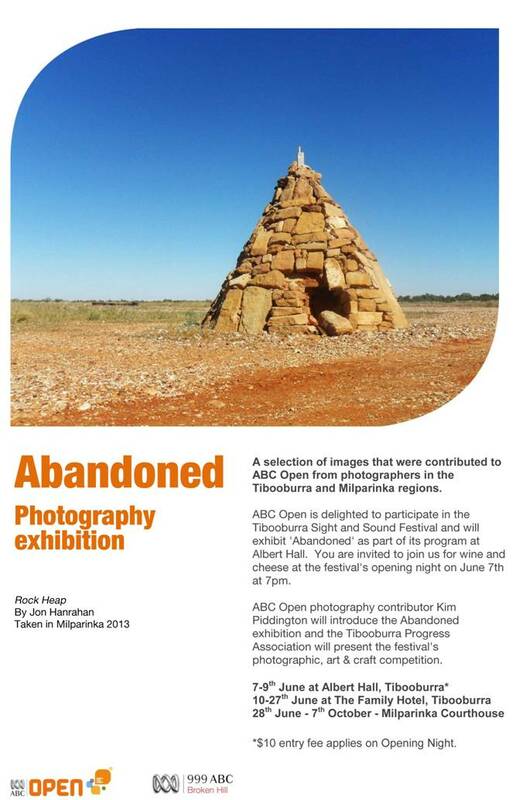 ABC Open Broken Hill's Jenia Ratcliffe is visiting Tibooburra in Far North West NSW this weekend to take part in the opening of the 'Abandoned' photography exhibition. The exhibition is part of Tibooburra's Sight and Sound Festival which runs over the June Queen's birthday long weekend. The official opening is tomorrow Friday 7 June, at Albert Hall, Briscoe Street, Tibooburra. For $10 you can enjoy wine and cheese and the first chance to see the exhibition. See details below. The exhibition is a collection of work that was captured during the ABC Open Broken Hill photography workshops in April. See my article of 18 April 2013 about that event via this link. The Festival itself will take place on the main street of Tibooburra, and will include a variety of stalls, food and activities for all the family, so it's well worth the trip according to Jenia. Okay, Tibooburra isn't exactly around the corner, it's about 335 km north of Broken Hill (or 1,189 km from Melbourne - I won't be going), but it's a long weekend so there's more time to explore this isolated but fascinating historic town. After a few weeks in Tibooburra the exhibition will move on to nearby Milparinka, which is where some of the photographs were taken, where it we be on show from 28 June to 7 October 2013. Here are the links to ABC Open Broken Hill's information about the exhibition and Sight and Sound Festival.